Proprietary Name: 365 Everyday Value Cavity Fighting And Whitening What is the Proprietary Name? 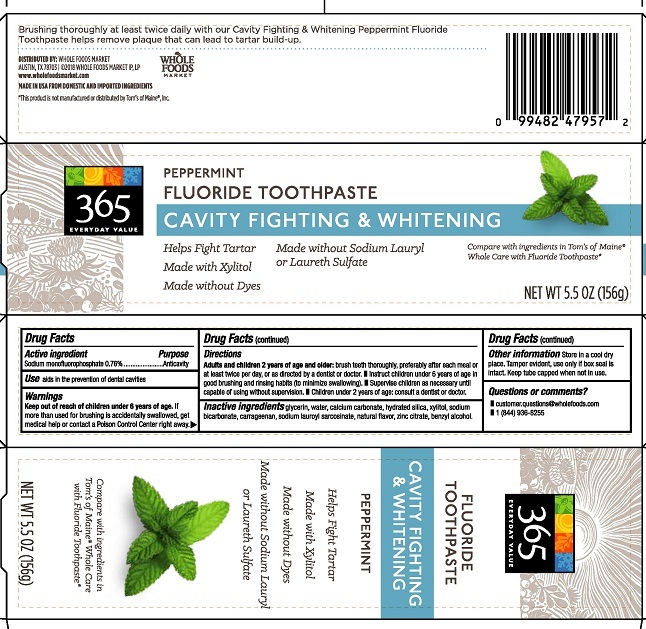 365 Everyday Value Cavity Fighting And Whitening with NDC 42681-5002 is a a human over the counter drug product labeled by Whole Foods Market, Inc.. The generic name of 365 Everyday Value Cavity Fighting And Whitening is sodium monoflourophosphate. The product's dosage form is paste, dentifrice and is administered via dental form. Other informationStore in a cool dry place. Tamper evident, use only if box seal is intact. Keep tube capped when not in use.